Isle of Iona: A Scottish Island so small - yet so rich in Christian history! Very few people are familiar with the name Iona but once it was one of the best loved names in Christendom. It is a little island in the midst of the Innera Hebrides or Western islands of Scotland. It is noteworthy that the Hebrew name for Dove is Iona and in Latin Columbia for under the influence of a man by the name of St. Columbia the glory and renown of Iona blossomed into full glory. It developed into the most famous center of Celtic Culdee Christianity the mother community from whence missionaries were dispatched for the conversion of the pagan tribes in Scotland and Northern England. It has been said of Iona "Blessed is the eye that see-eth it especially in the spring and summer months." So very small and modest in its aspects and overshadowed by its more imposing sister island Iona's sacred spell is often missed by the passing stranger. But for those who have eyes to see there is a subtle beauty in its apparent barrenness: a beauty of atmosphere; a beauty part physical and part spiritual. ... E. Raymond Capt was so impressed with what he found during his visits to Iona he promised himself that some day he would have to write about it. This book is the result of that promise made long ago. 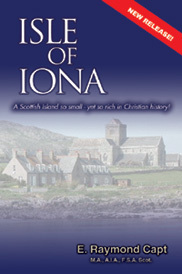 Isle of Iona: [Capt] A Scottish Island so small - yet so rich in Christian history! 5.0000 out of 5 based on 1 ratings. If you want to Learn your History this is the book. If you Family comes from Scotland. This book was so good, that I stopped Reading it cause I did not want to end. I placed the order on Thursday Early, and had the order on Friday. So Yes I am so happy with this Company. But I do live less than one hour to one and Half hour away.